To the E and N of Cairn Toul are cliffs contributing to the western wall of the Lairig Ghru, but to the W and the S (at least as far as the Buidheanach of Cairntoul) the slopes are easy. An easy path from the E leads from the Corrour Bothy in the Lairig Ghru through Coire Odhar to a col NW of the Devils Point. The route continues NNW on easy slopes to the summit of Cairn Toul. Easy ascents are also possible from either Glen Feshie or Gleann Einich. Due to its proximity to Sgor an Lochain Uaine these mountains are invariably climbed together. Looking back at Cairn Toul en route to Sgor an Lochain Uaine, 01/03/14. Looking north towards the final push to the top of Cairn Toul. Carn Toul from Ben Macdui; 15 August 2016. 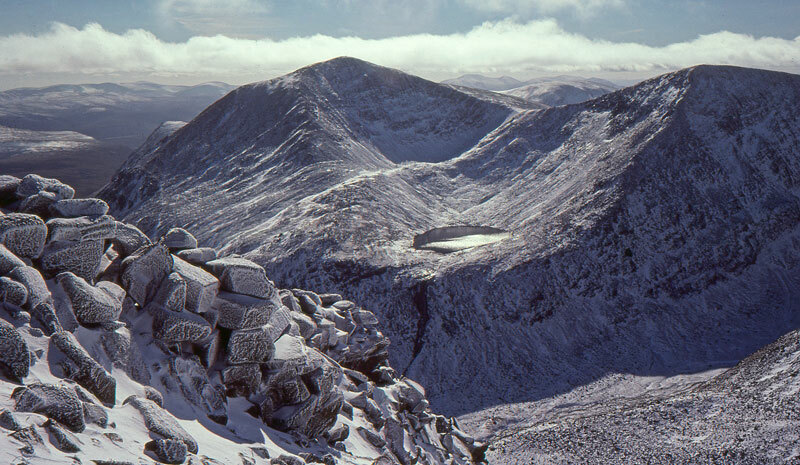 Cairn Toul from Braeriach; September 1979. 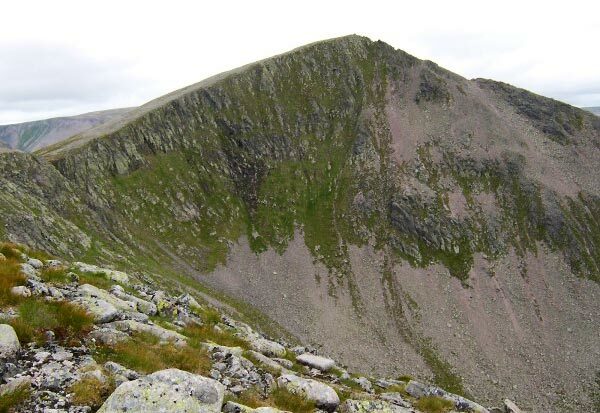 The summary information of one or more ascent routes that include Cairn Toul. 1 1290 m 41.69 km 10.5 hrs Cairn Toul, Sgor an Lochain Uaine, Beinn Bhrotain, Monadh Mor and The Devils Point Long route on mixed terrain over 5 Munros in the Cairngorms. Cycling on the initial approach will reduce the time required for this walk. Care required for navigation and proximity to corrie rim in poor visibility. 2 2220 m 35.67 km 11 hrs Braeriach, Cairn Toul, Sgor an Lochain Uaine and The Devils Point Climbing is moderate but there is a lot of it. The centre km of the Lairig Ghru and the Chalamain Gap have significant boulder fields which will be hazardous in the dark. The route is strenuous and long but rewarding. Not suitable for cycle access. 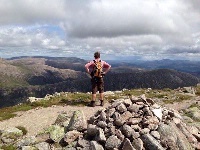 3 2020 m 38.03 km 11.5 hrs Cairn Toul, Sgor an Lochain Uaine and The Devils Point A long route that tests endurance, although there are no difficult ascents. The walk can be shortened by cycling to Derry Lodge. 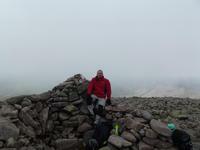 Me at the top of Cairn Toul, 01/03/14 (honest!). 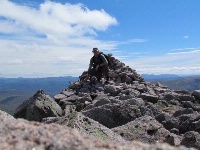 Summit of Cairn Toul, 09.08.12. Post a few words about Cairn Toul or read what others have had to say. Walked Neil Cuthbert's route taking in Beinn Bhrotain, Monadh Mor, Sgor an Lochain Uaine, Cairn Toul and The Devils Point. This was one of the best days walking in a long time, lots of sun and fantastic views. 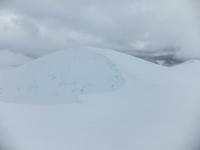 Be careful around Sgor an Lochain Uaine and Cairn Toul as there are still snow cornices but the Devils point is clear. Many thanks to Neil for an excellent route. Good Expedition hills these. We did them from Linn of Dee with the help of bikes and a tent. Boy they're big! A fantastic, if long, day from Coylumbridge over Braeriach to Corour Bothy, About 10.25 hours. Shorter if you don't carry backpacking kit like me!